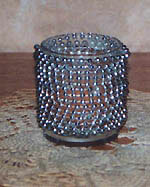 A beaded candle holder will add beauty to your candles. Many gift shops sell them at a very high price. You can make them very inexpensively. All you need for this project is a small votive candle holder and string beads. You can get these beads at a craft store or else you can make your own with beading thread and beads. If you make your own you can use different color beads and then you have a completely different look. Apply a dab of glue and start with the end of your beads. If you are in a hurry like me then put just a little dab of hot glue to start the beads on the holder. Let that dry completely. Take a piece of cardboard or even a paint brush and spread some glue on the holder and then start wrapping the beads around the candleholder. I use a tacky glue that dries clear. Try to keep them as tight as you can. Continue wrapping and gluing the beads in place. When you come to the end just cut the beads apart and apply a dab of glue. Let dry completely and then you can put your candles in the beaded candle holder. The flame will show through the beads and make them shine. These candle holders look very nice on a group setting. You can make taller candle holders the same way. Try varying the color of the beads. If you have a small mirror that you can set a group of them on they really look nice that way. Put some small flowers or potpourri around them and you have a great centerpiece.